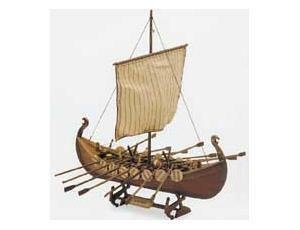 The Artesania Latina Viking Longboat wooden ship model measures in at 293mm long. This kit is highly realistic with many fine details. Stories of the famous Viking longboats pillaging Europe in the 10th century are now stuff of legend. These speedy vessels where manned by oars and propelled by sails to reach coasts across Europe, and even as far as America. The Artesania Latina Viking Longboat wooden boat kit is a fun introduction to model boat building, and is recommended for the starter.